We are delighted to invite you to see a range of exquisite glass products, share our passion and enthusiasm for crystal clarity of glasses which bring to your home a completely new culture of drinking experience. This is an exceptional opportunity to be part of a unique project which will offer you an occasion to buy various limited edition decorated crystal glasses. Our huge range of crystal products includes glass vases, decanters and carafes and with more crystal creations to come that will satisfy you due to their outstanding aesthetic and affordable value. We haope that you appreciate the beauty of selection that is on the offer. 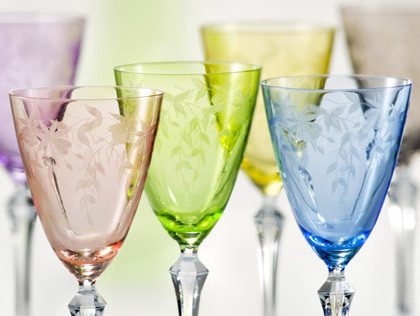 We strongly believe that you, your family and friends will enjoy great feelings that come from using such distinctive crystal glasses. A vast range of attractive and affordable plain crystal glasses. Delicately blown and precisely perfect in their proportions, guaranteeing uniqueness and splendour of any assortment with new exciting designs and collections only available here. Decoration makes the final product innovative and distinctive. Produced by hand with traditional decorative techniques including: engraving, painting, etching, screen printing, spraying and sand blasting, you will be able to find the perfect combination for a variety of celebrations. A balanced offer of Vases, Carafes, Decanters and Bowls both plain and decorated allows you to easily tune the style of any interior, impressing upon it your own individuality and style. Decorate your home with Crystal and also share your passion as a gift for friends and family.